However, we did do some hiking. 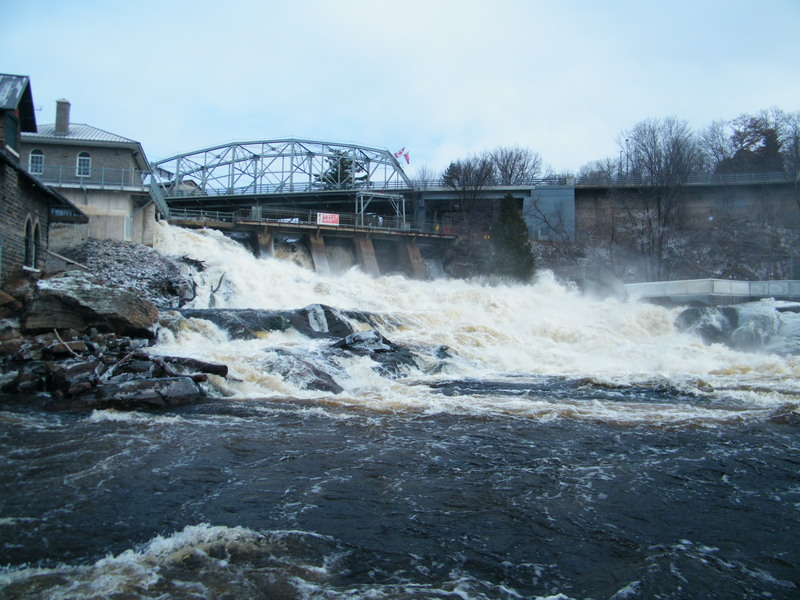 We “explored” downtown Bracebridge, as well as hiked around the spectacular Bracebridge Falls. 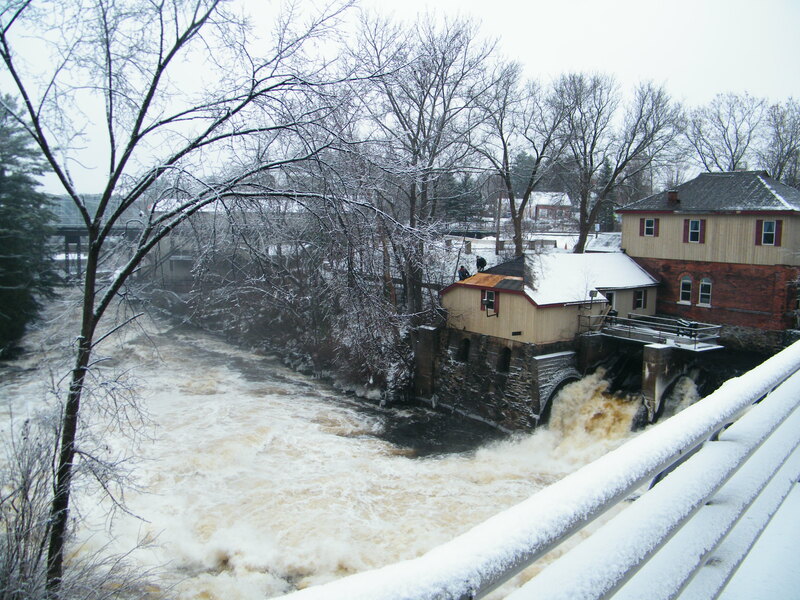 Due to heavy late November snowfalls, followed by “soaked to the bone” rainfalls, which melted the previous snows, the river was extremely powerful and fast. 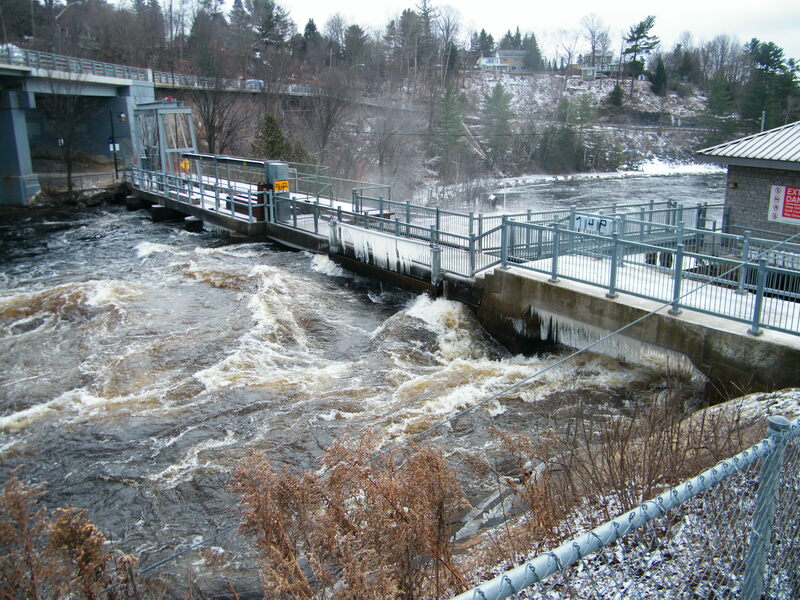 Rising to within inches of the pedestrian walkway, that crosses the river just as it tumults down over the falls with a thunderous roar, the walkway was closed because of a thick layer of slippery ice formed by sub freezing temperatures, a strong wind and water spray. Lynne and I ended up taking the high road, which is the highway bridge that crosses the river to get to the other side. River a mere inches below pedestrian walkway, before it plummeted over the falls. 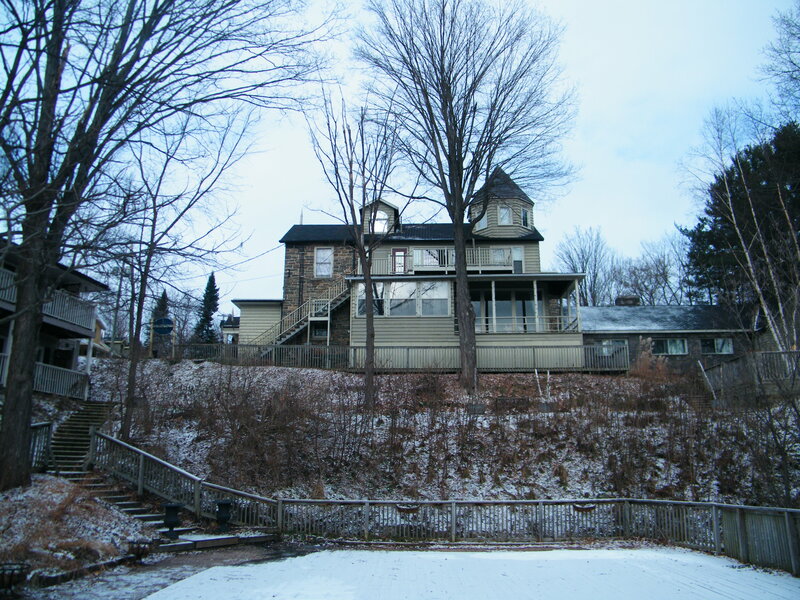 It was only then, that I noticed 2 brave roofers, re-shingling the roof of a historic building, that was situated precariously right at the very edge of the icy, wild, raging river. If one of these roofers were to slip, the only thing from keeping him from falling over the edge, and swept away by the icy rapids, and over a second waterfall a short distance downstream, was a rope, a lifeline to keep them safe and secure. 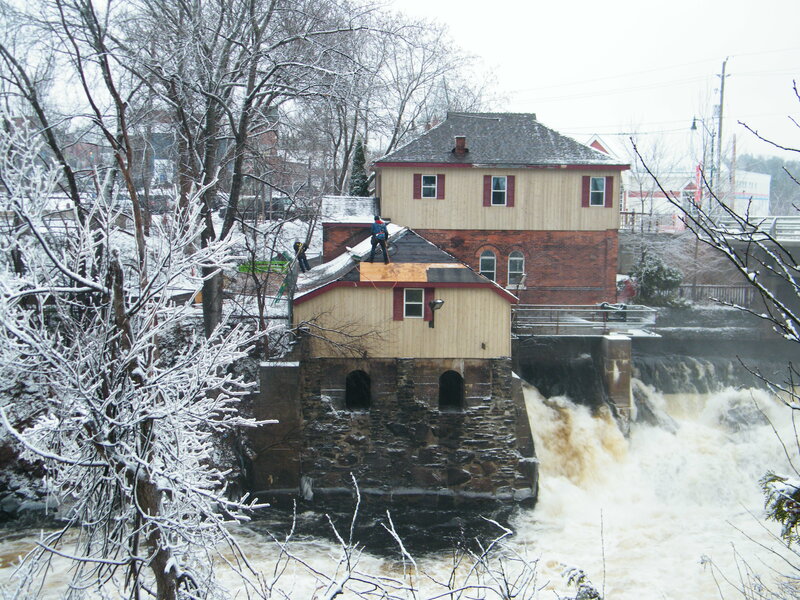 Roofer working precariously over Bracebridge Falls. Life at times can be very precarious for us human beings. One moment we are safely on solid ground and everything is wonderful and great. The next moment we might find ourselves falling. Whether it is a job loss, or a debilitating accident or sickness, no one is immune. If a lifeline does not catch us, we can fall over the edge and be swept away by the raging current. Rapids leading to a 2nd waterfall downstream. Christmas season can be particularly devastating for some people. Particularly this time of year, our local charities, churches and food banks work extremely hard to try and be that lifeline to those desperately in need, being very discreet to protect the dignity of the recipients. 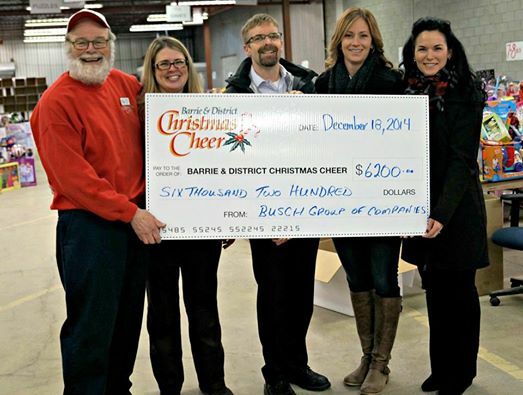 There is still time to help those in need this Christmas. Please support your local charities. The 2nd waterfall downstream, as it passed under the pedestrian walkway! It was absolute wonderful time. Thank you for reading and commenting my friend! 🙂 So important just to slow down. That is an interesting thought of what you shared regarding Canadians and kindness activities. I never really thought of it. Do you notice it? I know kindness activities goes on everywhere around the world, we just don’t hear of it. Unfortunately the only thing we hear from the news is the violence, as it erupts in different parts of the world. Yes I did notice it when I was actively looking for kindness related stories over the internet. Mostly new initiatives were started from Canada. Wow, I never knew that Trablogger. You have such a wonderful character, to be actively looking for “kindness related stories”. Carl, what a beautiful place you chose to spend these days! Thanks for sharing beautiful photos; your words are equally beautiful and introspective. Your generosity and of your co-workers is touching. Coming from such a respected photographer and blogger as yourself, your comment really means a lot. THANK YOU! Yeah, I have great co-workers, who are extremely generous! Thank you very much for your kindness. I’m humbled to receive such a compliment but I’m just an amateur blogger who loves photography. Your photos are stunning and deserve the best comments. Isn’t that amazing what you can do without using a professional camera? I believe the reason is simple; the most important is the sensitive eye of the photographer, and the great photos are shot even before you click. You are doing great and a course brings new techniques that are very useful. Have a good day and keep clicking! Thank you so much for your wonderful encouragement. I am becoming more and more aware of photo opportunities, which would be attributed to blogs such as yours. Thank you, my friend Carl! I’m looking forward to seeing your creations. Can’t wait! Wow, that roofer has some courage! What a beautiful place. I wish you the best this Christmas and I am so glad to become acquainted with you and blog! Yeah, I couldn’t believe it, when I noticed the roofer up there. Thank you for the Christmas wishes, and the same to you in return Kelli. It has been great connecting with you through the blog. Carl, your photos are stunning, looks beautiful…but cold! I can’t imagine the roofers working in the conditions that you described, very scary. True, I agree, “no one is immune” from the twists and turns that life offers. Wonderful post, stay warm and enjoy the Holiday Season! Yeah the water would be much colder than the surf in Cali. Even if someone were to survive the rapids, the cold water would quickly bring on hypothermia. It is indeed scary. As always, thank you so much for your kind words. Wonderful post, Carl. I appreciate the simple and profound in it. Wow, chk out that river. Glad you got to kick it. Thank you for the faithful read. It is a pleasure to share in your journey. Thank you so much Diana for your kind, encouraging words. I admire you how all your responses are always so personal. It shows the amazing character you have. So glad to have made that connection. So true, and it sounds like a nice getaway. Yall must be better at preparing for Christmas than I am, to be able to take a pre Christmas break and still finish shopping! ! I’m the worst procrastinator ever. Preparing for Christmas is not too bad, we are really fortunate. With Lynne’s family all in New Zealand, any presents have to be in the mail by mid November. Although there might be a few last minute dashes, having that November frame of mind really helps get a lot of my side of the family in Canada out of the way as well. Wow, what a place. I am sure you had a lot of fun!! Beautiful pictures and such a wonderful, profound analogy. Happy New Year, friend! 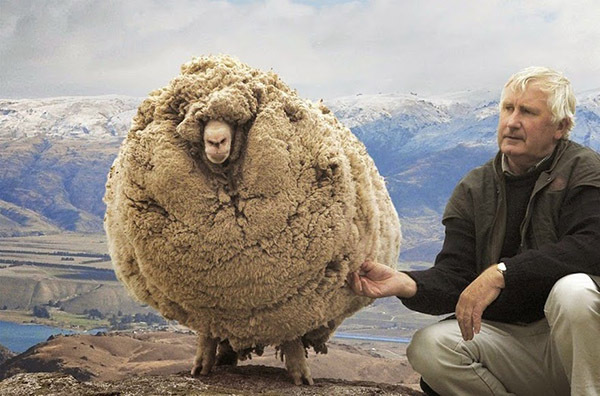 Carl, I’m so glad that you and your wife had a chance to get away together. It looks like a beautiful spot, although I would probably appreciate it more in the summer time! 😉 Despite being a Minnesota girl, I do NOT enjoy the winter! Just wanted to mention that I loved your illustration about the roofers and the life-line. Thanks again for your using your blog as a platform to move people to give to something bigger than themselves! I am so grateful for the many charities and organizations out there that provide families and individuals with food, shelter, and special gifts/experiences during the holidays and throughout the whole year. They truly are a life-line to so many. Blessings to you and your family in the new year! Thank you so much Paige for your encouragement! Thank you for the blogging connection this past year. And God’s blessings to you and your beautiful family for 2015. So glad you had a chance to go away with your wife. My husband and I make it a point to go away at least once a year even if it is just to someplace local and for one night. We really cherish those “alone” times together. I hope you two are able to go away more regularly. Great post. Quite a place! I sincerely want to thank you for your comment, and really understand now why this is important you. I absolutely LOVED our getaway. Life gets busy, but I know now that “things” can wait. From now on, I am going to try and get away , just the 2 of us at least once a year.